Hello everyone, I hope you are having a great day. Thursday is a MDC's challenge day. Our challenge this was was to create a card based on Tamara's sketch. Here is my creation: I used this cute image from Stampavie Pricky Love, I colored the image with regular color pencils and watercolor pencils, then I added a bit of Red Marker on the hearts and the head band. The pretty paper is from Daisy Bucket Playful Petals - Libby. The rhinestones are from Zva Creative Bling. 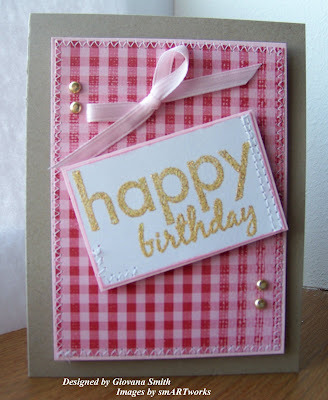 Card Recipe: Pink Pirouette, Riding Hood Red, White. Paper: Playful Petals-Libby by Daisy Bucket. Embellishments: Rhinestones by Zva, Gold Stickles. Accessories: 3D Foam by EK-Success, Colored pencils, Watercolored pencils, sponges. 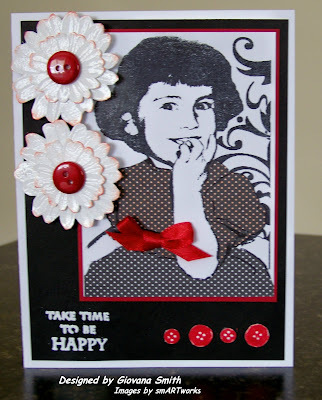 Head over to MDC Challenge blog and check the other DT member creations. Hope you like my card and play along too!! Hello again, I made these cute, quick and easy cards for a great cause. Lesa is donating Encouragement cards to a local shelter. I made 3 Thinking of You cards, they all the same LO but different colors. Card Stock: Chocolate Chip, Tan Parchment, Brilliant Blue, Bashful Blue, Mellow Moss, Certainly Celery, White. Ink: Chocolate Chip, Basic Brown, Buckaroo Blue, Mellow Moss. Embellishments: Green Organdy Ribbon, Martha Stewart Ribbon (blue and cream), Dew drops. Accessories: 3D foam by EK-Success, Cuttlebug, Textil Embossing folder. I hope you like them. Tea Party Challenge : Stitches ans Ribbon!!! Hello my friends. It's time for another smARTworks Tea Party Time, my challenge for you was to create a project using "Stitches and Ribbon". So happy for you! : This is a very monochromatic card. For this card I used LOL Set. 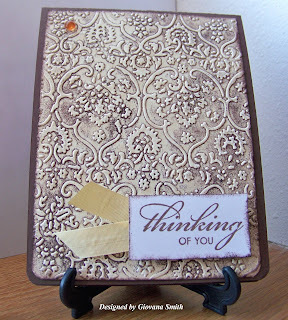 I stamped the image in Basic Brown Ink and the sentiment was stamped in Chocolate Chip Craft Ink, embossed then using Clear Embossing powder. Card Stock: White, Tan Parchment (The Paper Company). Ink: Basic Brown, Chocolate Chip Craft. Embellishments: White Satin Ribbon, Dew drops. Accessories: Sewing machine, white thread, SU Dimensionals, 3D foam EK-Success, Clear Embossing powder, Embossing gun. Card Stock: Kraft, Riding Hood Red, White. Embellishments: Green Ribbon, Dew drops. Accessories: Sewing machine, white thread, Aida Fabric, DMC Thread (red, pink, green), Mini glue dots, 3D foam Ek_Success. I hope you like my projects and play along too, the keyword is SCTP10 if you upload your creation on any online gallery. Don't forget to check out the other DT creations: Susan, Dina, Trish, Donelda . Hello my friends, few days ago I created quick and easy cards. They are simple, no sewing, no pattern paper, just easy and quick. All the images are from smARTworks. 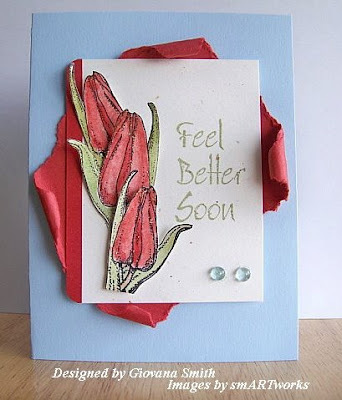 Feel better soon: For this card I used one of the new release sets from smARTworks Tulip Square Set. I stamped the tulips, colored them and them cut them out. I used Water colored pencils and I also used some Ink to color the images. The sentiment is stamped in Certainly Celery. I took a piece of Riding Hood Red CS and a very thin paint brush so I could get the curl effect on the CS, finally I added a couple of drew drops. Card Stock: Bashful Blue, Riding Hood Red, Su Naturals, White. Stamps: Tulip Square Set by smARTworks. Ink: Certainly Celery, Stazon Black. Accessories: Mini glue dots, Su Dimensionals, Diamond Stickles. 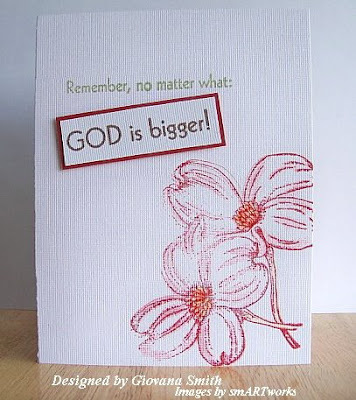 God is bigger!! : This card is super quick!! I used another new release set from smARTworks Dbl. Dogwood. I stamped the flowers on the lower corner and colored it a little bit with regular colored pencils.I added a bit of Gold Stickles. The sentiment was stamped in Certainly Celery and Basic Brown. The part stamped on Basic Brown was positioned with a piece of Riding Hood Red and Dimensionals. Stamps: Dbl. Dogwood by smARTworks. Ink: Riding Hood Red, Certainly Celery, Basic Brown. Accessories: Gold stickles, Color pencils, SU Dimensionals. 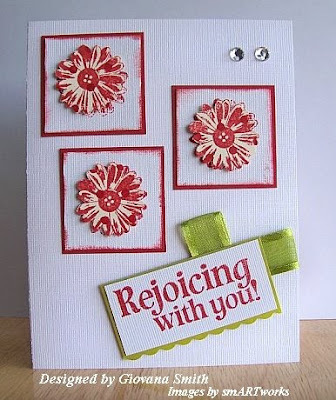 Rejoicing with you: For this card I used another new release set Buttoned Up. 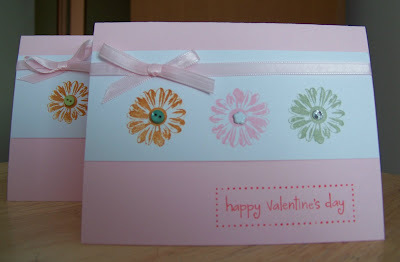 I stamped the flowers direct onto the White CS and also onto Pattern Paper. Then I cut out the flowers from the Patter paper and positioned over the stamped image with Dimensionals. Every square is 1 1/2". I sponged them a little bit with Riding Hood Red Ink. I added a couple of Clear Rhinestones on the upper corner and some ribbon on the sentiment panel. Card Stock: Bazzill White, Riding Hood Red, Kiwi kiss. Stamps: Buttoned Up by smARTworks. Embellishments: Organdy Green Ribbon, Clear rhinestones. I hope you like them. Don't forget our Tea Party Challenge : "Stitches and Ribbon". I hope you can play along with us. I have a couple of cute creations for this challenge. Hello my friends. 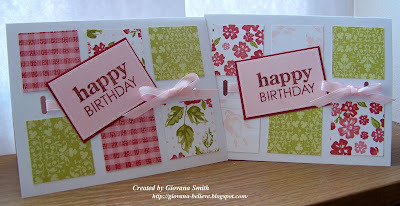 Today I want to show you 3 cards I made for Gina K. January Release Party Challenges. January Release Challenge #1 This is a Scrapbook Sketch Challenge by Ericka Martin, but it could be translated as a card challenge too, so I decided to make a card, I am a really bad scrapbooker. Here is my interpretation: You Make me Happy!! Card Stock: Pink Pirouette, Riding Hood Red, Certainly Celery, White. Stamps: Skating by Stampavie, SU Boho Backgrounds (sentiment). 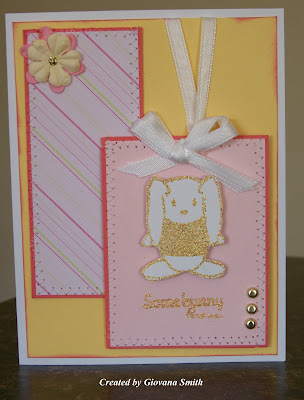 Embellishments: Dew drops, Prima flowers, Gold Stickles, Diamond Stickles. Accessories: Watercolored pencils, Sewing machine, white thread, Mini glue dots, SU Dimensionals. 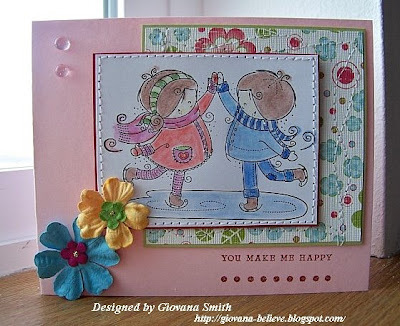 January Release Challenge #2 A Card Sketch by Jessica Fick. Here is my interpretation: Laugh Out Loud. Card Stock: Pacific Point, Bashful Blue, White. 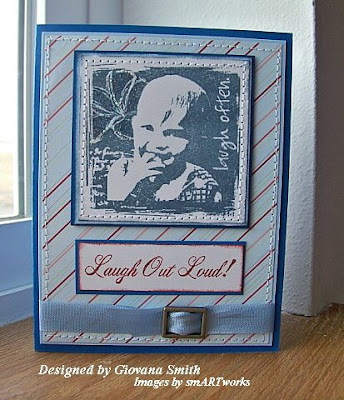 Paper: Oh So Loved by Heidi Grace Designs. Ink: Buckaroo Blue, Cranberry Crisp. Embellishments: Martha Stewart Ribbon, Hogdepodge Hardware, Diamond Stickles. Accessories: Sewing machine, White thread, Mini glue dots. January Release Challenge #3: Something Sweet Create a project with using the theme "Sweet." It can be something with the word "sweet", some kind of edible "sweet", something for a "sweetheart" or something that makes you say, "ahhh, that is so sweet." Here is my interpretation of something sweet: Enjoy the Day. Card Stock: Cranberry Crisp, Pink Pirouette, Pretty in Pink, White. 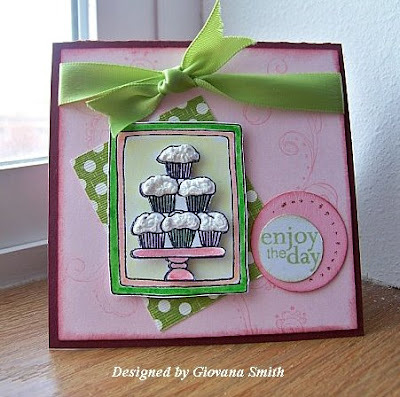 Stamps: SU Doodle This, Enjoy by Daisy Bucket Stamps, Cupcakes. Ink: Black, Certainly Celery, Pretty in Pink. Embellishments: Lemon Grass Offray Ribbon, Diamond Stickles. Accessories: SU Dimensionals, Mini glue dots, Liquid Applique, Diamond Glazze. This is my creation: For my card I used one of the new Pattern Paper by Imaginisce: Twitterpated - Lady Bug Ball, the image is from Stampavie Enjoy The Moment. The ribbon id from SU. My card is 5"x5" square. The inside says Happy Valentine's Day. Card stock: Pink Pirouette, Red Riding Hood, White. Paper: Twitterpated-Lady Bug by Imaginisce. Stamps: Enjoy The Moment by Stampavie. Hello my friends, I hope you are having a great day. I am not having a good one, since yesterday I am feeling sick and I have not idea why, I was just fine, worked out really good and suddenly I started feeling sick, even some temperature, not fun. Just trying to do everything really easy. I want to show you cute and easy cards I made today for a good cause. This time Lesa is donating "Get Well Cards" to her local Children's Hospital. I made 4 cards for little kids. I hope they like them and really get better soon. Card Stock: White, Tangerine Tango, Bashful Blue. Embellishments: SU Ribbon, TAC Twill Ribbon. Accessories: Watercolored pencils, Sewing Machine, White thread, Mini glue dots, Plastic Canvas. Hello ladies, it is time to announce the theme for our smARTworks Tea Party Challenge. This time I am hosting the challenge and I hope you can play along with me too!! 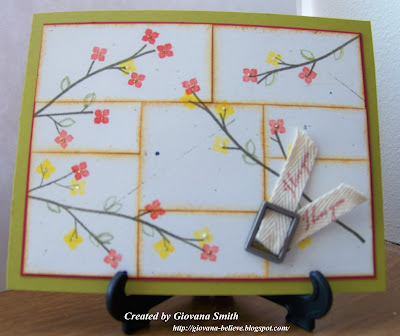 The challenge is: "Stitches and Ribbon" Just create a card or project using real, stamped or faux stitches and include some ribbon in it, that is!!! I think this challenge is going to be fun, I can wait to see your creations. If you play the challenge, please post a link here or if you upload your creation on any online gallery the keyword is SCTP10. I will post my creation next Wednesday. Thanks so much and I can't wait to see your creation. 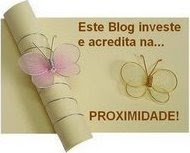 Hello my blogger friends!!! I have received more Blog Awards. Thanks so much for give them to me, that makes me feel so good!!! I have received 3 awards from Julie, Julie is one of the first card makers I met on a MSN group, my first card group!!!! 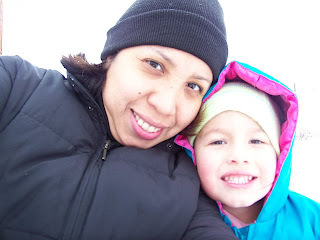 She is blogging now and her creations are always an inspiration for me, Thanks Julie!!! I've also received a Proximity Award from my good and sweet friend Leslie. Now here is the deal, I have to pass these awards to great bloggers and because I consider YOU my friend a great Blogger, these awards are for YOU!!!! Yes, I am not going to select especial people because everybody deserves an award, please pick these and share them with your blogger friends. On other notes, my computer is sloooowwwww and I am having problems with my Blog Candy picture, so please be patient, I will fix the Computer problem and post my blog candy, you are going to love it!!! I will be back with some blog candy to express my Thanks to all of you. DD is sick, not fun, but today she is looking a little bit better, we decided to stay home and not go to church, we don't want to pass the bug to other kids, I am feeling a little bit stuffy, yikes, I hope I don't get that from her. Hello my friends, I hope you are having a great day. I want to show a card I made from a RAK, a sweet lady from my RAK group on SCS sent me a PTI set, how cool is that!!!! so I decided to give it a try. I cased this card from Nicole Heady. I changed the colors and added my own touch to the card., I stamped the sentiment onto the Twill ribbon, so what do you think? Card stock: Kiwi Kiss, Ridind Hood Red, SU Natural Confetti Cream. EmbellishmentsL Hodgepodge Hardware, Twill Ribbon. Accessories: Mini glue dots, sponges. Have a great and blessed day!! 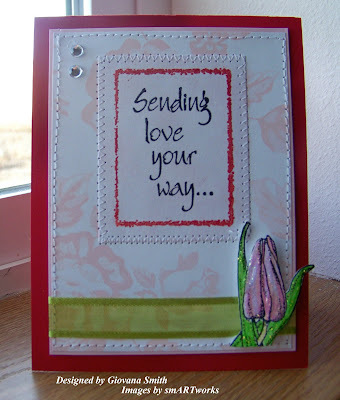 Hello everyone, today our challenge on MDC Blog is to case a card from any DT member. I chose this card from Maria. I changed the images, colors, embellishments, LOL I just kept the LO. For my card I used one of the new addition to MDC Store," Stampavie Stamps". I chose Taking Care stamp, this girl is so cute and fun to color, even my daughter wanted to color her, LOL. I used colored pencils and some Markers, then I applied some Diamond Glaze over the image to give it a shiny look. The paper I used is Magic Meadows (on sale now), this is a double sided paper, so I used both sides. I also added some Pink Crystals from Zva Creative bling. Card Stock: Riding Hood Red, Pink Pirouette, White. 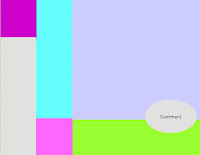 Paper: Magic Meadows (Imaginisce Paper ). Stamp: Taking care by Stampavie. Embellishments: Pink Crystals (Zva), Offray Pink Ribbon. Accessories: Sewing machine, White thread, Diamond Glaze, Mini glue dots, Su Dimensionals, Gold Stickles. Hello everyone, I am here again, promess this is the last post for today. I made this cute girlie Birthday cards to donate to a good cause. Lesa is going to donate all the card she'll receive to a Children's Shelter, so I am sending her these 2 cards. They are very simple, but make them with a lot of love. Accessories: Horizontal Slot Punch, Uni Ball Pen. 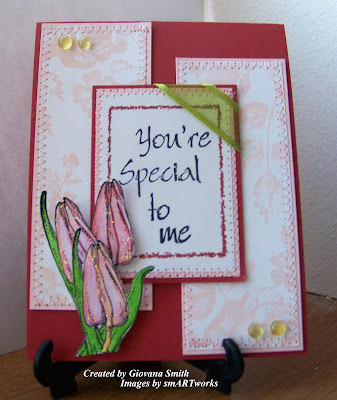 You are Special to me. 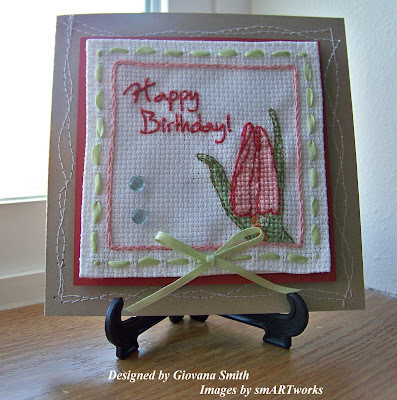 For my card I used smARTworks Tulip Square Set. I stamped the image 3 times, colored them with colored pencils and Markers, then applied some Diamond Stickles. Cut them out and position on top of the other panels. I zig zag the side panels and added some Yellow Dew Drops. Ink: Stazon Black, Cranberry Crisp. Embellishments: Green Organdy Ribbon, Dew drops, Diamond Stickles. Accessories: Sewing machine, pink thread, mini glue dots, 3D foam, SU Dimensional. Labels: Sketch Challenge, smARTworks stamps. Tea Party Challenge #9 : Glittery!!! Hello everyone, it is time for another smARTworks Tea Party Challenge!! Donelda has challenged us to use something glittery in our creations, so without further add, here are my creations. HAPPY BIRTHDAY!!! This is a very simple and cute card. 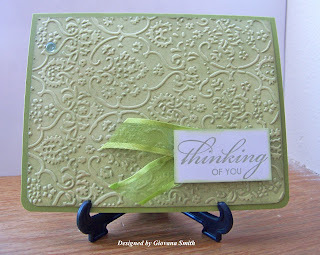 I used the Combo Sentiments Set, embossed it in Gold e.p. I added a couple of gold brads on the upper and bottom side, a cute pink bow and that's it. Sewing machine used for the zig zag and straight stitches. 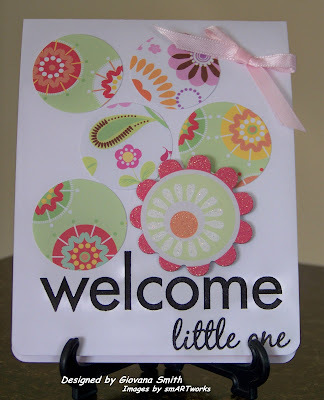 Card Stock: Kraft, Pink Pirouette, White. Embellishments: Gold brads, Offray Pink Sattin Ribon. Accessories: Mini glue dots, 3D foam, Gold Embossing powder, Embossing gun. 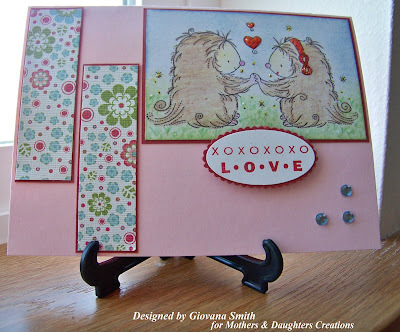 SENDING LOVE....: I really like this card, now the Valentine Day is coming, this card is perfect for the occasion. I used Tulip Square Set fort his card. I embossed the frame in red pigment and red e.p. The sentiment was stamped in Stazon Black as well as the tulip. I colored the tulip with colored pencils, added a little bit of Markers and then some Diamond Stickles. I added two Clear Rhinestones on the corner. The ribbon is very shiny and really pretty!!! Card stock: Real Red, Pink Pirouette, White. Ink: Red Pigment (Studio G), Stazon Black. Embellishments: Clear Rhinestones, Organdy Green Ribbon, Diamond Stickles. Accessories: 3D foam, Sewing machine, White thread, Colored Pencils, Markers, Red Embossing powder, embossing powder. I hope you like them and play along the challenge too!! 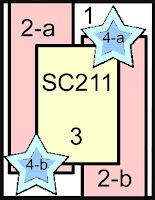 If you don't have any smARTworks stamps (yet) feel free to play using any stamps you own, then post your creation here or if you prefer to post on SCS or any online gallery use the keyword SCTP09. I can't wait to see your creations. 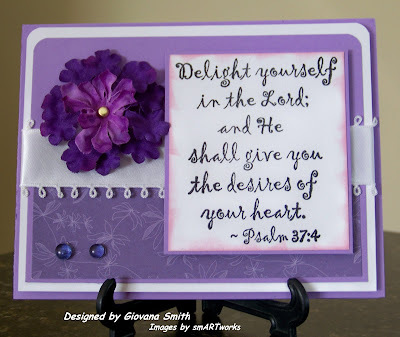 Now head over to see the other DT member's creations: Susan, Dina, Trish, Donelda and Peggy. I hope you like my creations. Hello everyone, today I am feeling a little bit better than yesterday, but my energy is level "0", oh well, after doing my house chores and homeschool DD, I decided I wanted to play today's Color Combination Challenge on SCS: Not Quite Navy, Kraft,Baja Breeze. I stamped my Cone flowers images on Kraft CS using White Craft Ink. I used my Stamp-a-ma-jig for it. Then when the images were dried I applied some Diamond Stickles and used my Sewing machine (zig zag stitches). I punched twice the main image using the Horizontal Slot, then I added the hodgepogde hardware and insert the ribbon. 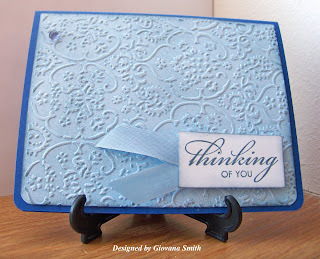 The sentiment is from Combo Sentiments Set . Card stock: Not Quite Navy, Kraft, Baja Breeze, White. 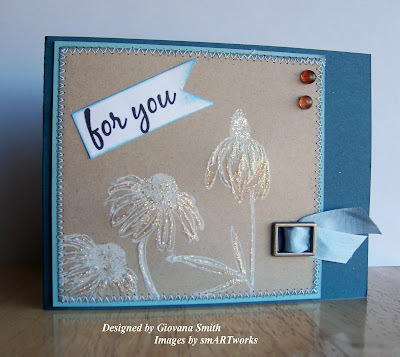 Stamps: Cone flowers and Como Sentiments by smARTworks. Embellishments: Martha Stewart Ribbon, Hodgepodge Hardware, Dew drops, Diamond Stickles. Accessories: Sewing machines, White thread, Horizontal Slot Punch, Mini Glue dots, sponge. Labels: Color Combination challenge, smARTworks stamps. Hello my friends, I hope you are starting a great week. I am not feeling very well, I got a COLD!!! yikes!! I've been feeling sick since Friday afternoon and everyday is getting worse. I made these cards few days ago, but I didn't have any energy to post them, so here you have them today. These cards are for the Viva la Verve!!! challenges on Verve Forum on SCS. 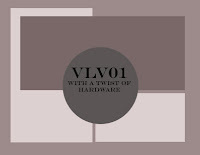 VIVA LA VERVE Challenge #1: Use of some Hardware!! brads, eyelets, frames, bookplates, anything metal! I hope you lik them. Have a blessed and great day. Labels: Verve Challenges, Verve Stamps. I just wanted to drop a line and say I am Still Here. I have been busy with family stuff. I have created a couple of cards, but I haven't taken pictures yet. I will post those tomorrow. Also be prepared because my blogoversary is coming!!! 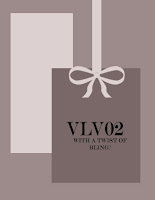 and I have a really nice and cute Blog candy for YOU!!!! Since yesterday I have been feeling a little tired and I think I got the cold or something because the only thing I want to do is sleep, not fun. I promess to come back tomorrow with something to show you. 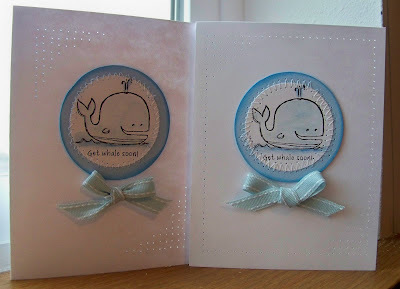 Hi everyone, I want to show a very simple, cute and easy card to make. You need only an image and a sentiment, that's it. For my card I stamped the image 3 times in water colored card stock, then I colored the images with Watercolor pencils and a little bit of Markers. I added some Clear Glitter around the wings. With my Bone folder I marked the ares I wanted to make the holes and that's it. 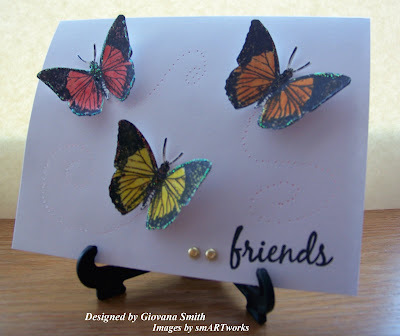 Stamps: Cone Flowers and Combo Sentiments by smARTworks. Accessories: Watercolor pencils, Markers, Clear Glitter, Needle. Let me know you were here!! Thanks for stopping by. Hello everybody, I hope you are having a great day!! 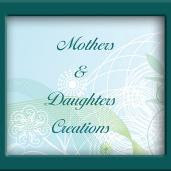 Today is Thursday and it is time for another challenge over Mothers & Daughters Creations Blog. 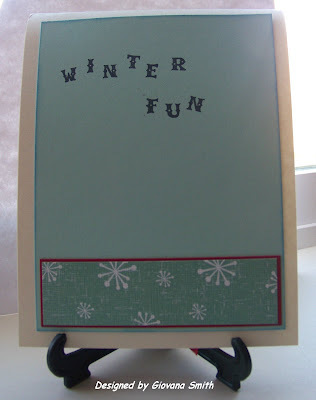 This time our challenge was to create a Winter Fun Card. I just remember few days ago playing in the snow and having so much fun!! so I decided to use one of the new stamps from Stampavie Snowman. I colored the image with Watercolor pencils and Markers. The pretty paper is from Daisy Bucket Collection:Merry Wishes - Holly Jolly. I used my sewing machine and added some stitches around the Designed Paper and the Image. I added 3 Clear Crystals from Zva on the left corner of the image. Card stock: Aqua Mist PTI, Real Red, Cream, White. Paper: Merry Wishes-Holly Jolly from Daisy Bucket. 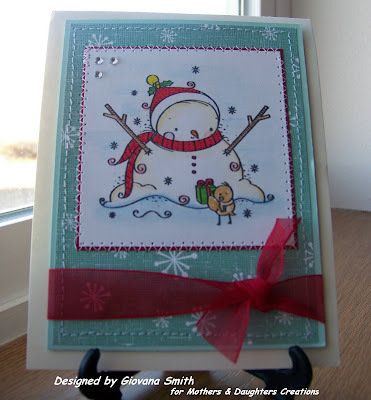 Stamps: Snowman from Stampavie, Alphabet by Studio G.
Embellishments: Red Ribbon, Clear Crystals,. Accessories: Sewing machine, white thread, Mini glue dots, Watercolor pencils, Markers. I hope you like it. Please let me know you were here!! Have a great day and Thanks for stopping by!! In the Spotlight: Get two sets: BFL-04 Iris Bloom and WD-14 Glory for $7.25 (This include S&H anywhere in the USA). Overstock Central: All these sets 50% off!! 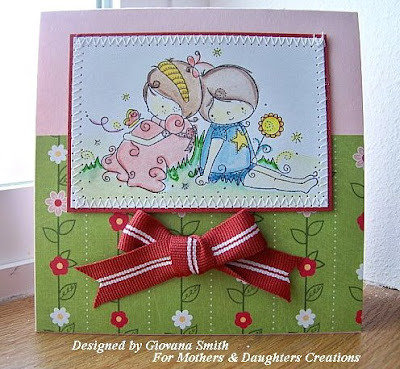 Mothers & Daughters Creations: Basic Grey Paper: 25% off !!! Great prices for great Paper. Imaginisce Paper Fairest Of Them All Collection : 25% off!! Imaginisce Stamps Fairest Of Them All Collection : 25% off!! Take advantage of these offers!! Hello everyone, It is time for another Tea Party Challenge. This time Donelda is challenging us to use "Something Glittery".Anything glittery will do, glitter, shiny cardstock, bling ... just make sure you have something glittery on your card. Just think about of all the glittery things you can use!! We will upload our creations on January 14th. Feel free to play along with us. 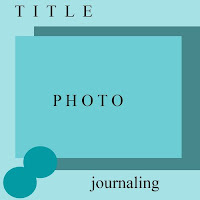 Create a project and make sure you leave a comment in any of the DT blogs or use the SCTP09 keyword if you upload your creation in an online gallery. I can't wait to see your creations!! Hello everyone, I want to show a Valentine Card I made today. Very simple and less than 10 minutes to create a card, a record for me, LOL. By the Way, would you like to see here on my blog a "10 Minute card" or something like that??? Just let me know and I will prepare something easy and pretty for you. 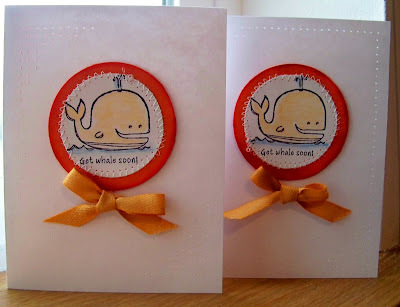 I made these cards to donate to a Nursing Home, how cool is that! !, I checked Punkydoodle Papers Blog and when I read this I say Yes!! I can donate cards too!! Card stock: Pink Pirouette, White. 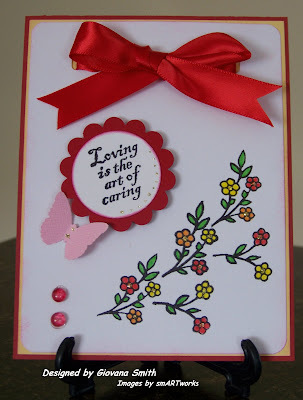 Stamps: Buttoned Up by smARtworks, sentiment by Studio G.
Ink: Pretty in Pink, More Mustard and Mellow Moss, Red pigment. Embellishments: Buttons, White flower brad, Clear Rhinestones. Get Inspired: This challenge is to create a card inspired by one of the ODBD Design Team. I chose this card from Becca Feeken's gallery. 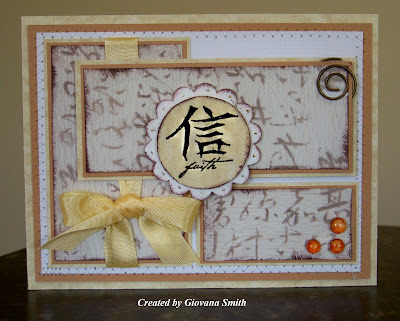 Here is my card: Joyful..
Card Stock: Baja Breeze, Desert from the Paper Company. Embellishments: Martha Stewart Ribbon, Gold brads. Accessories: Sewing machine, light blue thread, Mini glue dots, 3D foam by EK-Success. This challenge was to make a card to send to someone who needs encouragement. Bonus Prize: Make your card "Purple"
Card stock: Lavender Lace, White. Paper: Lavender Flowers on Purple by PAPER PIZAZZ. Ink: Stazon Black, Plum Pigment for sponging. Embellishments: Plastic Flower, gold brad, Dew drops, White Satin Ribbon. Accessories: Corner Rounder Punch, Mini glue dots, 3D foam by EK-Success, sponges. This challenge is to make a black & white card, with a splash of color. This is my card: Take Time to be Happy!!! Card Stock: White, Black, Real Red. Paper: Die Cuts with a View "Dots"
Ink: Stazon Black, Red Pigment. Embellishments: Red Buttons, Offray Red Satin Ribbon. Accessories: White Embossing Powder, Red Embossing Powder, Embossing gun, 3D foam by EK-Success, Mini Glue dots, sponges. 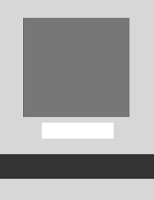 This challenge is to create a card with a repeated image. Card stock: Riding Hood Rec, Barely Banana, White, Real Red. Stamps: Art of Caring by smARTworks. Ink: Stazon Black, Plum for sponging. Embellishments: Offray Red Satin Ribbon, Dew Drops, Gold Glitter. Accessories: SU Markers, Mini Glue dots, 3D foam by Ek-Success, Horizontal Slot Punch, Martha Stewart Butterfly Punch, Corner Rounder Punch. Hello everyone, I hope you had a great weekend. I had some stamping time yesterday and suddenly I had a horrible sinus headache, I had to stop and relax and rest. Today I am feeling much better and I am praying for not more sinus headaches, they are horrible. 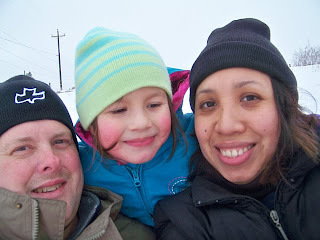 Anyway, have you checked Dina's blog??? If not, well you should, she is celebrating her birthday, New Year and more of 100,000 hits!!! She is posting challenges everyday and she is giving away really cool prizes. Paper: Chester Pink Flower by Me&MyIdeas. 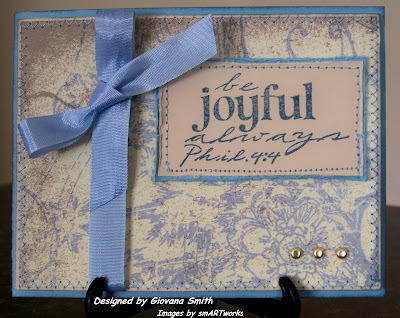 Stamps: Combo Sentiments by smARTworks. Accessories: Corner Punch, Mini glue dots, Coluzzle. I hope you like it!! I will be back in a few with more cards!! Hello everyone! !, Today I was planning to stamp, BUT I had to do other things first like laundry, put away the Christmas decorations, clean the house, after that we went to pick up our new book shelf, anyway, we came back home and I helped my husband to move it into the house, oh my, the book shelf was heavy!!! I made a bad movement and the heavy weight shelf landed in my head, hurts really bad, poor me. Anyway, today I went to Costco and I bought a Chrome Desk Organizer, super cool. 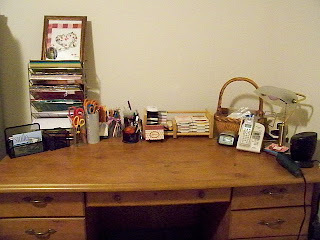 You don't want to see where I had my cardstock before, LOL. 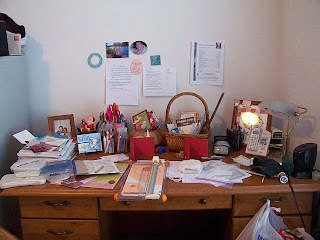 After that, I went to my Craft room and my desk didn't invite to work at all, so I decide to clean it up and here the results. Now I can stamp and find everything I need. Happy New Year everyone!!! I have to say that I am enjoying this time with my family. 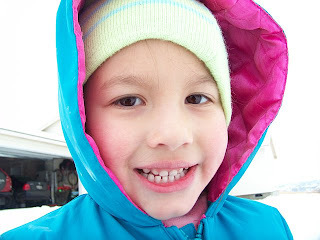 Yesterday, January 1st, we spent2 hours playing in the snow, building a snowman and throwing snow balls to each other, of course after that we were a little bit cold, but we had a lot of fun!!! I hope tomorrow I can get some time to create.